From a leading journalist and activist comes a brave, beautifully wrought survival story of navigating childhood during the height of the AIDS and crack epidemics, searching for intimacy and love as a young gay man, and ultimately finding a calling fighting for justice and liberation in the Black Lives Matter and LGBTQ movements. When Darnell L. Moore was fourteen years old, three boys from his neighborhood tried to set him on fire as he was walking home from school. Darnell was tall and awkward and constantly bullied for being gay. That afternoon, one of the boys doused him with gasoline and tried lighting a match. It was too windy, and luckily Darnell’s aunt arrived in time to grab Darnell and pull him to safety. It was not the last time he would face death. What happens to the black boys who come of age in neglected, poor, heavily policed, and economically desperate cities that the War on Drugs and mass incarceration have created? How do they learn to live, love, and grow up? Darnell was raised in Camden, NJ, the son of two teenagers on welfare struggling to make ends meet. He explored his sexuality during the height of the AIDS epidemic, when being gay was a death sentence. He was beaten down and ignored by white and black America, by his school, and even his church, the supposed place of sanctuary. He made it out, but as he quickly learned, escaping Camden, escaping poverty, and coming out do not guarantee you freedom. It wasn’t until Darnell was pushed into the spotlight at a Newark rally after the murder of a young queer woman that he found his voice and his calling. He became a leading organizer with Black Lives Matter, a movement that recognized him and insisted that his life mattered. 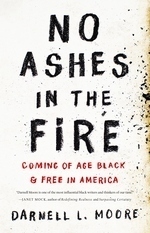 In recovering the beauty, joy, and love in his own life, No Ashes in the Fire gives voice to the rich, varied experiences of all those who survive on the edges of the margins. In the process, he offers a path toward liberation.